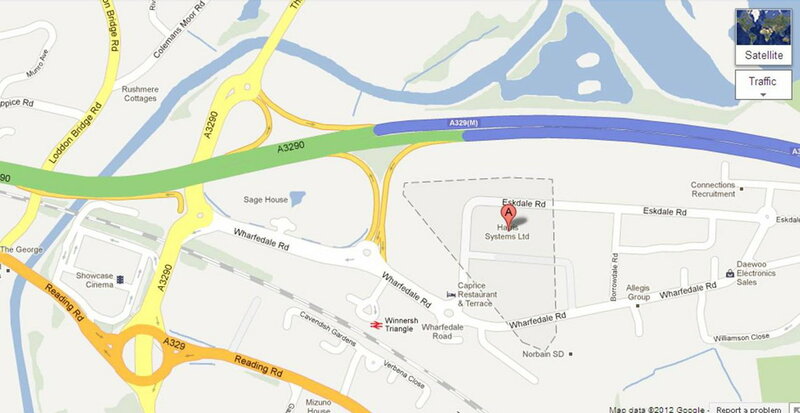 From M4 London/Heathrow, leave the M4 at Junction 10 and follow the A329(M) towards Reading East. Take the first exit signposted Lower Earley/Winnersh/Woodley. At the traffic light take the first left into Wharfedale Road. The hotel is located on the left hand side on the corner of Eskdale Road. The hotel is directly next to Winnersh Triangle Rail Station (Reading to Waterloo service), only 1 minute from hotel over landscaped foot bridge, providing easy access to London Paddington in 20-minutes from Reading Central. The hotel is a 20 minute drive from London Heathrow Airport. Passengers driving from Heathrow to the hotel are recommended to take the M4 (West Bound - heading away from London). Once out of the airport, follow the signs towards the M4 then continue along the M4 until Jct10. Take the A329 (M) exit towards Reading (East). Take the 1st exit towards Winnersh/Woodley/Early/A329. Keep in left lane then take 1st left at Traffic Light into Wharfedale Road. At roundabout take 1st exit at Traffic Light into Eskdale Road. The hotel is on the left. Passengers taking public transport to the hotel can take the Heathrow Centre Bus to Reading, then the train from Reading to Winnersh Triangle (6 minute journey) on the Waterloo Service (2nd stop from Reading). The hotel is accessed via the white pedestrian bridge directly outside the station. Please call us on 0118 944 0444 or email reservations@hireadinghotel.com should you require any additional information.